The weather's turned a little cooler this week and the college kids are moving back. Soon the leaves will change and it'll be time for another fall theatre season in New England. So thanks to Joel Brown at Hub Arts for tipping me off to some great sources for news about what's coming up and Art Hennessey of Mirror Up to Nature for compiling a list of this fall's "should see" plays and musicals. 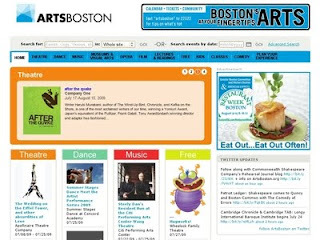 First, there's ArtsBoston, which offers reduced-price tickets and bills itself as a "one-stop shop" for arts and entertainment. A new resource is Explore Boston Theatre, the brainchild of Nicholas Peterson, who has extensive experience in using the Internet to promote the arts and nonprofit organizations. The mission of the Web site is to connect audiences with excellent theatre productions throughout New England, although it does seem a little Boston-centric right now. Hopefully that'll change as it gets off the ground. The past year has brought changes to the national economy which affect the financial health of theatres. We need theatre now more than ever. It promotes the public dialogue about what matters to all of us. Why? "New work asks the questions we're afraid to ask, and it does it with respect and in-your-face compassion. New works make us laugh in the face of hopelessness, instruct in the face of ignorance, and call attention to our lives just in the nick of time." Is 90 minutes theatre's holy grail? I sure hope there are clowns! Is Alice Ripley's mercury rising? Happy birthday, Steve On Broadway!